Perennial Designs is the husband and wife team of John & Angie Falstrom. Angie is a miniature watercolor artist and John takes care of operating all the machinery necessary to create the products derived from the original paintings. 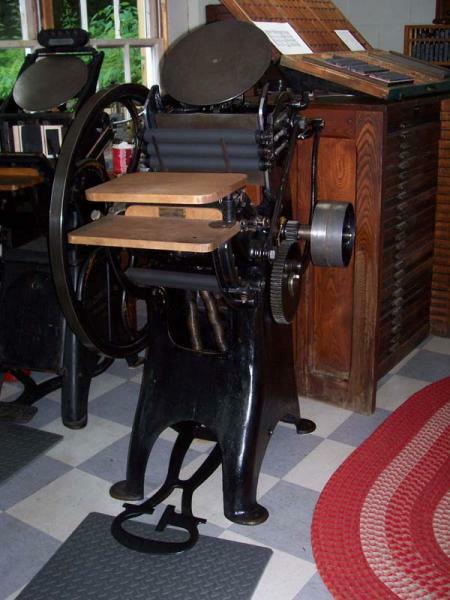 In addition to our art studio, we have a fully equipped letterpress shop where John produces letterpress products, gives letterpress instruction, sells press parts, and purchases, restores, and resells Golding presses when available. We also print and bind softcover books. I just obtain a Pearl 11 and I need the delivery board and brackets. Is there anyone who has them or send me a pattern so I can get them made? DickG sent me a message that you could help. My main concern is making or getting the brackets for the feed board.